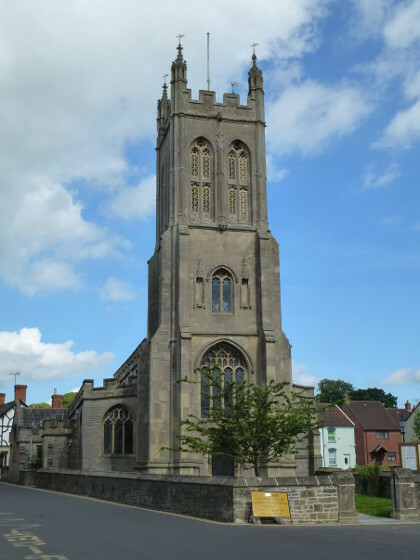 St Benedict's is located near the top of Benedict Street, which continues down from the bottom of Glastonbury High Street. Click here for a map (in a new window), courtesy of streetmap.co.uk. Our regular service schedule is shown below. We are a Church of England congregation which forms part of a United Benefice with St John's in the High Street, and St Mary's at Meare. Click here to read more about us and our worship. The church was originally dedicated to St. Benignus or St. Bennings and retained this until the middle of the 17th century. Bishop Benignus was a great friend and disciple of St. Patrick and became his successor. Click here to learn more, here to access an educational resource pack for schools in PDF format (~760 KB) and here to download a PDF file of the pictures that go with the resource pack (~26 MB). Benefice Eucharist (lasts just over an hour). Uses Common Worship (modern language); mostly said. Shared non-eucharistic worship with Glastonbury United Reformed Church. but service is at 10.30 am when at the URC. See church notice board or church online diary for details. Followed by coffee and biscuits. Service relocated from St John's during reordering. Fellowship and informal worship shared around tables with tea, coffee and biscuits. Followed by a simple lunch. Worship and Word (lasts about an hour). A non-eucharistic service with Bible teaching. United Benefice worship with St. John’s and Meare. Venue and times vary. See here for details. Details of other events in St Benedict's can be found here and events in the Benefice can be found at our Benefice diary site here.